From the first time I saw Bocote wood I was struck by it’s rich beauty. I find the colours both warm and brilliant. The contrast of the golden amber and the darker grain lines was beautifully striking. Though I wanted to build a guitar from it I could not readily find Bocote pieces that were wide enough to work. This all changed a couple of years ago when I was lucky enough to find a small quantity of Bocote in the sizes necessary to build guitars. Don Ross asked if I would consider taking on a Harp Guitar project. Though my first inclination was to run as fast as I could in the opposite direction, I soon warmed up to the idea and was pretty excited about the challenge involved. As usual Don gave me a lot of freedom on the design side but had a few details that he wanted to incorporate. The body size would be based on an SJ Jumbo, the same as every guitar that I've built for him and he specified 6 sub bass strings as well as a pinless bridge (a really long one!). Being a Fanfret the main neck used 25.4" treble and 26.25" bass scales. We chose African Padouk, a wonderful responsive tonewood that also looks great. For the top wood I used a large, but very old piece of Sitka Spruce that had some nice bear claw figure. The project took two years to complete including much R&D in the beginning and careful design work, especially in regards to the top bracing. After breathing a large sigh of relief I must say that I am pleased with the results. Don now has the guitar in his very capable hands and I am really looking forward to hearing what he comes up with. Another challenge of this project was sourcing out a case, since you can't buy one of these off the shelf! I was fortunate to find a keyboard flight case where I custom fitted the interior with foam and velour lining which worked out perfectly. One of the attractions of guitar building for me is the ability to create a wide range of guitars starting with one basic model. Even small detail changes can greatly alter the character of an instrument. In this talk, I’d like to show you what I mean. An instrument bound with plastic will have a different character than a wood bound model. In plastic, a Grained Ivoroid will impart a vintage feel to a guitar as opposed to the more modern look of white or black plastic. On the wood side, Maple will give nice contrast against a darker back and sides while Rosewood bindings will give a darker, more conservative look. My maple bound models utilize Flamed or Curly Maple to add yet another visual dimension. Shown above is how your binding choice can really delineate the accompanying back & side tone woods. Generally, the choices are Spruce or Cedar. Spruce can range in shade from light tan to white, depending on the species while Cedar is usually darker. As well, they each have a different tone so the sound as well as the look has to be taken into consideration when designing an instrument. A Spruce top can be shaded to impart a different effect for those who don’t like a white top. This is commonly done on Classical models. There are many species of spruce available from all over the world, Sitka, Engelmann, Adirondack, Alpine, Lutz and many more. Note: The differences in the lighter spruces, such as Adirondack, Lutz, Alpine and Engelmann are very subtle in appearance. The choices here are sharp, (Florentine) or rounded, (Venetian). It’s amazing how the look of a guitar can be altered by using a different cutaway shape. Some builders opt for one style only while others offer both. Left to Right: Florentine Cutaway (sharp), Venetian Cutaway (soft). This technique is often used on tops but can also be used to great effect on Maple guitars where the possibilities are almost limitless as shown. Other shading may include darkening a Mahogany neck to deepen the colour or impart a visual dimension. Another use of shading is to spray a light yellow coat to the entire instrument to impart an aged look. Shading can be done many ways, a traditional 2 or 3 tone sunburst or just one tint, for desired effect. Thank goodness this area is finally opening up. When I started in the 70’s, the accepted choices were Rosewood, Maple or Mahogany! Due in part to the scarcity of traditional tonewoods, alternatives have become increasingly popular. I’ve always believed that excellent instruments could be built with a wide range of tonewoods. Not only do these alternatives each have their own distinctive sound, but the visual possibilities are exciting as well. Below, a few common species I offer but there are many more being added, (please enquire). 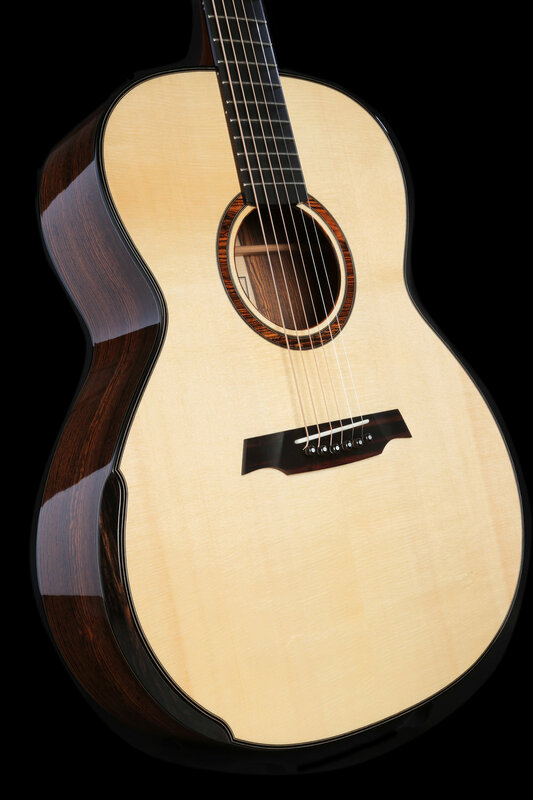 Inlaying an instrument with various types of shell as well as other materials can transform an otherwise plain guitar into a dazzling visual display, limited only by the taste of the customer, (or lack thereof) and the abilities of the builder. There are other ways in which to change the character of an instrument such as the use of a clear tap plate in place of the traditional teardrop pickguard. Opting for one or the other here can change the whole look of the guitar. Some players even opt for no pickguard at all but this is best only on Classical models or where the player doesn’t strike the top at all. Using a slotted headstock in place of a solid can be very effective on certain models. Of course this changes how we approach inlay and tuner options. I like to use the slotted head on traditional looking instruments.